Live-stream link to chapel service (active about 15-20 minutes prior to service time): http://www.ustream.tv/channel/humphrey-funeral-service-inc If you are having trouble viewing the live feed on your smart phone, download the UStream app from Apple or the Google Play Stores to your phone and view the service through the app. A celebration of the life of Julia Henry Granger will be held at 11:00AM, Monday, June 25, 2018 at Humphrey Funeral Chapel in Russellville. Rev. Don Erwin will officiate. A time of visiting with friends will immediately follow the service at the funeral home. The daughter of Ralph and Mary McClung Caldwell, she was born November 21, 1932 in Camden, Arkansas and lived a life of 85 years that was filled with class and grace which she extended to everyone in her path. She passed peacefully surrounded by her family on Wednesday, June 20, 2018 at the Johnson County Health & Rehab in Clarksville. She was a Graduate of Searcy High School and she also attended Hendrix College and Arkansas Polytechnic College. Dr. J. Arnold Henry and Julia were married for 43 years until his passing on October 10, 1995. Together they served their community, their church and loved their neighbors and fellow travelers in the journey of life, ministering to those who were physically and spiritually in need. Later Julia and Edsel Granger were married in September of 1998 and they enjoyed time traveling and finding ever new opportunities to serve by working with the various ministries of their church. Mr. Granger passed away on June 29, 2016. She was also preceded by a brother, William Caldwell. Julia was very active in her community and played a vital role in establishing the Salvation Army in Russellville. She was a member of Central Presbyterian Church where she had served in many different ministries including serving on the Board of Elders. 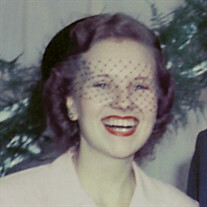 She is survived her four children, including a daughter, Julia McAnulty (Mike), Muskogee, OK; 3 sons, Dr. Andy Henry (Judy), Little Rock, Steve Henry (Tony Aguirre), San Francisco, CA, and Jeff Henry, San Francisco; 4 grandchildren, James, Mark and Luke Henry and Matthew Maul; 2 sisters, Jo Henry, MN and Dorothy Wright, Dardanelle. The family wishes to express their heart felt appreciation to Julia's friends and caretakers at Johnson County Health and Rehab. They loved and cared for her like family for her last two years. Memorials may be made to the Vera Lloyd Presbyterian Children's Home, 1501 N. University, Ste 345, Little Rock, AR 72207 (www.veralloyd.org). Internet obituary and on-line guest book are available at www.humphreyfuneral.com.